Mira Nakashima (b. 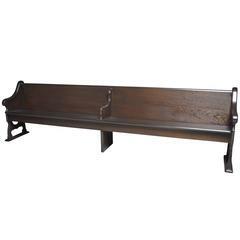 1942) Monumental custom bench in solid American black walnut with seventeen inlaid rosewood butterflies, raised on hand-turned tapered legs. Signed: [MIRA NAKASHIMA]. Executed by Nakashima Studio. American, 2005 Provenance: Skidmore, Owings & Merrill. Hyatt Headquarters, Chicago, IL. Chicago iconic architect Bertrand Goldberg bench, from his residence. 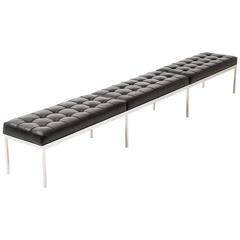 This extra long has three loose tufted cushions on a chrome-plated base. 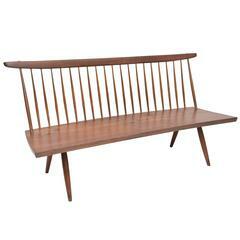 Rare slat bench by Harry Weese, horizontal slats with 2 metal uprights. An early example of this form by George Nakashima. 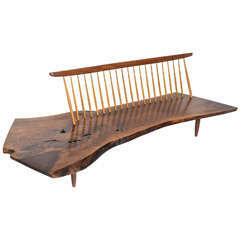 A great example of George Nakashima's conoid bench. Free-form sculpted edges with great colorful grain. A wonderful little bench or table. 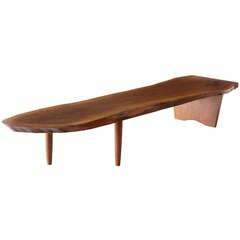 George Nakashima, coffee table/bench in American black walnut. Signed: George Nakashima, 1977. Organic bench style of Nakashima. Solid walnut bench with dovetails. Can also be used as a coffee table.